When you see your smile in the mirror or a picture, how does it make you feel? Confident or self-conscious? Empowered or held back? If you’re tired of worrying about people noticing your stained, chipped, cracked, gapped, or crooked teeth, Dr. Martinez can use cosmetic dentistry to make all of those flaws seemingly disappear. 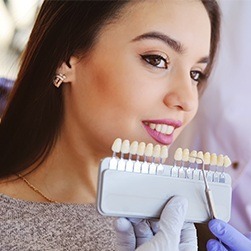 Whether you want a minor touch-up or a dramatic makeover, Dr. Martinez can help you get the kind of beautiful smile you’re always eager to show the world. Why Choose Glow Family Dental for Cosmetic Dentistry? 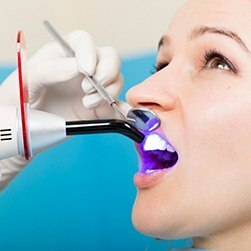 Dental restorations used to be strong but unnatural looking, but that is no longer the case here at Glow Family Dental. We can now provide crowns, bridges, inlays, and onlays that are made of 100% white dental porcelain, and they can be shaped and shaded to perfectly mimic a natural tooth down to the finest detail. In the end, you get the kind of dental work that looks nothing like dental work, and only you and your dentist will know that it’s there. By applying a color-matched composite resin to a tooth, Dr. Martinez can quickly cover up an annoying stain, small chip, or thin gap. He’ll artistically shape the composite to hide any flaw and look like a regular part of the enamel. This procedure only takes about an hour, is completely painless, and it’s a much more affordable solution compared to porcelain veneers. And, the results can easily last for up to 10 years. Zoom! is one of the fastest and most powerful whitening treatments available today. It combines a highly-concentrated bleaching solution with a special low-UV light to break up stubborn stains caused by coffee, wine, and tobacco in record time. We simply apply the whitening gel to your teeth, and then we shine the light on it to kick it into overdrive. In just an hour or less, we can easily make the teeth appear 6-8 shades whiter! If you would like to effectively whiten your teeth on your own schedule, we can provide you with your own custom-made kit. It will consist of a set of mouth trays specially-designed to fit your teeth as well as a bleaching solution much stronger than anything you’ll find at the store. Patients just have to use the kit daily for about two weeks to see complete results, though most patients notice a difference after their first use! 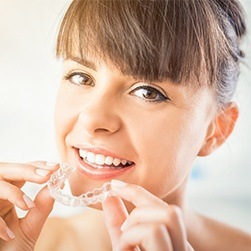 If you’ve always wanted to straighten your teeth, but have avoided doing so because you didn’t want to get metal braces, then ClearCorrect was designed with you in mind. 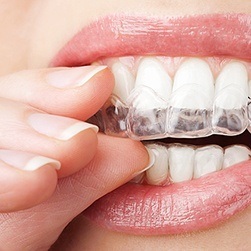 This system uses a series of clear plastic aligner trays to gently move the teeth into their proper positions, and they are so discreet looking that no one will notice you’re using ClearCorrect unless you tell them. 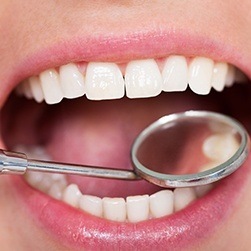 The trays are easily removable as well, so you won’t have to alter your diet or oral hygiene habits during treatment!